There exists a multitude of possible causes for abortion and infertility in the breeding ewe. Infectious and non-infectious agents can both play a role in abortion investigations. In Australia, abortion is an uncommon cause for reproductive wastage, as compared to other countries where intensive systems of lambing management are used1. Ovine campylobacteriosis (also known previously as vibriosis and epidemic abortion) is caused by Campylobacter fetus fetus and Campylobacter jejuni. Both organisms are capable of causing abortion in ewes; however C.fetus fetus remains the major cause of campylobacter associated abortions in Australia and New Zealand2. Ovine campylobacteriosis has been reported in all states and territories in Australia2. Making a definitive diagnosis can often prove difficult as animal health staff are often told about the abortions/infertility issues at a time when testing is not worthwhile (eg. owners noticed abortions/perinatal deaths but only began investigation around marking or weaning time). Appropriate sampling is essential in including or excluding various infectious or non-infectious causes of abortion. The following case-report aims to highlight to the reader a couple of cases of abortions in ewes and hopes to educate readers about Campylobacter abortion in ewes. The 1st property had 475 maiden Merino ewes that were scanned in lamb with twins. This mob was grazing an improved grass pasture paddock and had been on this paddock for approximately 1 month. Abortions started to occur in only this mob, which was approximately 4 weeks prior to the start of lambing. After bringing in a portion of this mob to the yards for their pre-lambing vaccination and drench, aborted foetuses were first noticed. The owner continued to notice aborted foetuses post-vaccination and drenching and continued to experience losses throughout lambing. The 2nd affected property, located SE of Young had 2 sets of lambing ewes: 1850 scanned in lamb with twins and 1300 scanned as singles. Both were mixed aged mobs mainly of 2-5 year old ewes, but also with some 6-7 year old ewes. The grazing history for this mob included a wheat crop paddock for a period of 2-3 weeks. At this stage the mobs did not have access to any supplementation (grain, calcium or magnesium). The mob was subsequently moved to a green pasture paddock after they received a drench and vaccination, approximately 4 weeks prior to the start of lambing. The owner did not notice any abortions prior to either of the mobs being moved to the yards for their management practices. Almost immediately post-drenching/vaccinating the owner noticed 5 sets of aborted twin foetuses. 2 ewes subsequently became sick, one of which recovered via subcutaneous injections of a ‘4 in 1’, the other ewe died. A further 5 ewes went down over the next few days, 2 of which recovered via treatments, and 3 that did not survive. 10 sets of aborted foetuses were noted in the 4-5 days following drenching and vaccination. Over a 2.5 week period after the sheep were yarded, the owner reported picking up approximately 60 aborted foetuses. Weatherwise, we had experienced a very wet start to winter, with approximately 12 inches (300mm) of rain occurring in the district over a 2.5 month period. Temperatures were averaging between 11C and 20C. The owners of both properties contacted the District Veterinarian for a case work up. 2 aborted lambs from the first property were examined via post-mortem. No gross abnormalities were noted. Both lambs had not taken a breath, had not walked, and had not metabolised any fat reserves. Both lambs weighed approximately 3Kg. 4 aborted lambs from the second property were also assessed via post-mortem. All 4 foetuses had taken a breath, none had walked, and there was no evidence of fat utilisation. One of the foetuses was ‘pot-bellied’ in appearance and upon dissection a haemorrhagic peritonitis was evident. This foetus had been refrigerated and body decomposition was well underway. There was some indication of consolidation towards one aspect of the left cranial lung lobe along with an interstitial oedema. Several coalescing white spots (<1cm in diameter) were present on one edge of a liver lobe. These white spots were not the typical pathognomonic liver lesions one would expect in typical abortion cases. Lambs weighed between 2.2Kg – 3.2 Kg. Samples from lambs from both properties were taken and included: Liver, lung and foetal stomach contents. Differential diagnoses at this stage included: Campylobacter, Liesteria, Salmonella, Toxoplasma, Leptospira, Q-fever, fungal organisms (aspergillus and other mycotoxins) and ovine brucellosis. Samples were tested negative for Listeria, Salmonella and Toxoplasma. All samples tested positive for Campylobacter and further PCR testing identified the subspecies to Campylobacter fetus fetus in both cases. 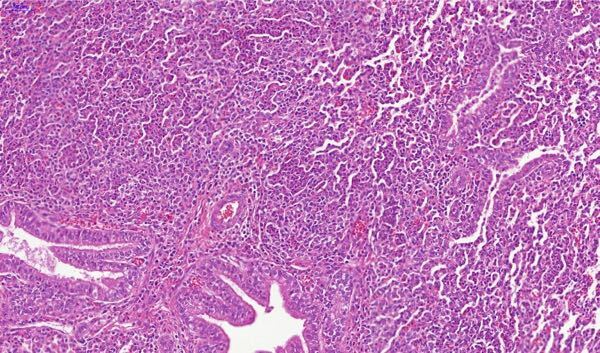 Histopathology also showed pathological lesions in the lung consistent with Campylobacter infection: moderate, subacute, multifocal, mixed, neutrophilic, histiocytic pneumonia. Image 4: Low power view of foetal lung, showing a focal area of hypercellularity (inflammatory cell infiltration) in centre of field. Image 5: Higher power view showing cellular exudate within alveolar lumina and also within a bronchiole (located near top right corner of the slide). Image 6: High power view showing mixed cellular exudate within alveolar lumina. 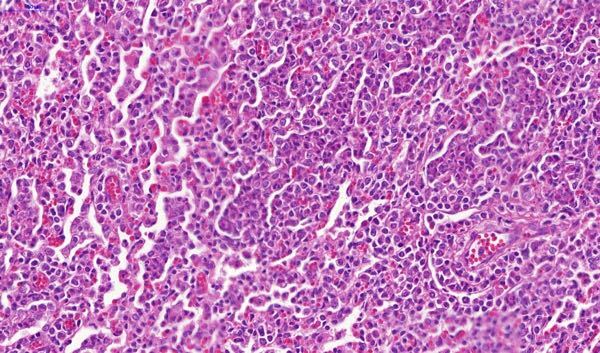 The cells are comprised of a mixture of neutrophils (have small dark lobed or angular nuclei) and macrophages (have round nuclei). Property 1 experienced losses of 15% in the affected mob, and 25-30% in the second property. Both properties have begun vaccinating their maiden ewes and newly introduced ewes starting this year. At the time of each of their outbreaks, owners were advised to maintain strict hygiene measures and to remove aborted foetuses as per the information stated below. Campylobacter fetus fetus and Campylobacter jejuni are microaerophilic gram-negative bacteria2. The organisms can be found in the gastrointestinal tract of some sheep as well as wild and other domesticated animals that show no signs of disease3. To date there is little information on the intestinal carrier stage of Campylobacter fetus. Campylobacter jejuni occurrence in cattle and sheep varies, but it rarely exceeds 50%4. Younger animals appear to be at greater risk compared to older animals and this has been attributed to higher stocking densities1. Campylobacter fetus fetus is transmitted by ingestion. The bacteria survive in the gall bladder and gut of infected sheep and crows and magpies can become infected for several months and thus become vectors1. Foxes and crows are known to shed the organism for several weeks following ingestion of infected lambs/placenta. Periods of stress, in this case environmental stress (cold, wet winter) and recently undertaken management practices triggers increased shedding of Campylobacter which propagates through the flock. Abortion occurs 7-25 days after infection and typically occurs during the 3rd, 4th or 5th month of gestation5. Stillbirths and weak non-viable lambs may also result from Campylobacteriosis. Abortion storms can occur 2-3 weeks following the first sporadic abortion. Incidence is typically 10-20% but in outbreaks can be as high as 50%. Contamination of pasture from uterine fluids and discharge post-abortion or birthing is a significant means by which the organism spreads during an outbreak4. Ewes can secrete the organism for up to 6 weeks via uterine discharge. There is usually no indication of abortion in affected ewes, but some may show signs of vaginal discharge2. On occasion affected ewes develop a metritis and subsequently die2. Experimentally it has been shown that ewes infected at 105 days had a 100% abortion rate, but ewes infected at 126 days had only a 20% abortion rate – reflecting immuno-competence of the foetus gestation6. 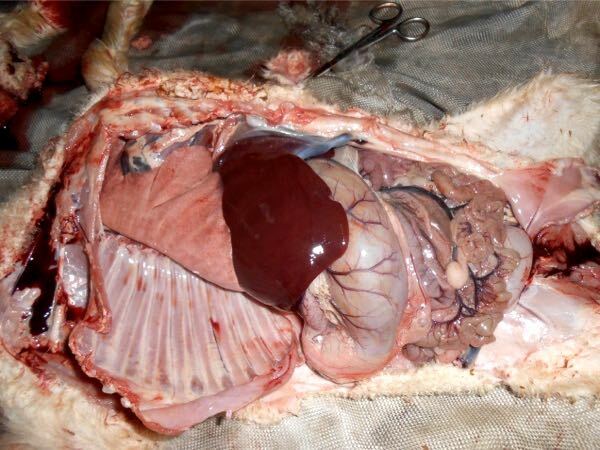 Gross pathological lesions can include: subcutaneous oedema, distended abdominal cavities giving a pot-bellied appearance – in such cases gross lesions may be apparent in the foetus/placenta2. The foetal cotyledons may be covered with yellow or dark brown exudate and necrotic plaques or oedema may be present in the inter-cotyledonary areas2. Liver lesions consist of extensive yellow-brown multifocal necrosis up to 2-3 cm in diameter with irregular margins. More commonly, the liver is enlarged, friable and diffusely necrotic. 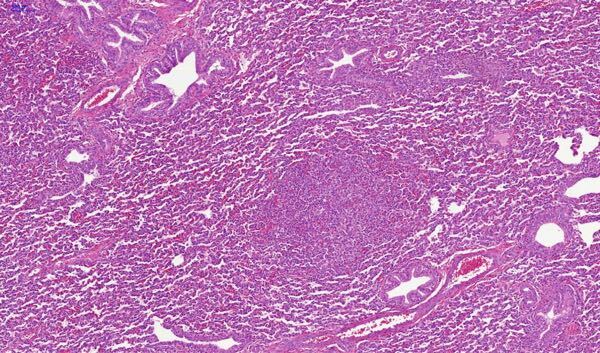 Lung consolidation6 and pneumonia (visualised via histopathology) are also lesions that may be present in aborted foetuses. The entire foetus and placenta can be submitted, but it is worthy to note that a post-mortem and body disposal charge for the foetus will occur should it be submitted. 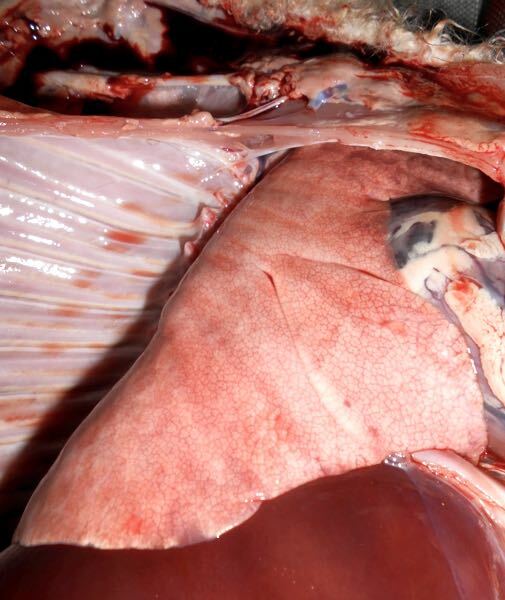 In lieu of this, parts of the placenta, foetal fluid, foetal stomach contents, liver (in formalin) and lung (in formalin) all make appropriate samples that can be taken. Samples of foetal fluid and stomach contents should be acquired with the aid of a sterile needle and syringe and placed in a sterile container for culturing purposes. All of these are representative samples and will aid in a diagnosis or exclusion of differential diagnoses in abortion investigations. Coopers® also offers a free laboratory testing to a limited number of sheep producers. The focus with this testing program involves flocks that have a significant unexplained wastage between scanning and lamb marking or those flocks where the maiden ewes have a significantly lower lamb marking percentage than their older ewe cohorts. Mobs of first lambing ewes (or a mob identified as having unexplained losses) with low lamb marking percentages will be selected on approved properties. 10 ewes will have 1 x 10mL plain red top vacutainer tube of blood collected. Aborted ewes typically gain good immunity and are unlikely to abort again. Where possible, isolate aborting ewes. Do no sell ewes from an infected flock for breeding purposes as some may be carrier animals and they risk transmitting the disease to other properties. Remove and burn aborted lambs and placental membranes – when doing so please advise farmers to wear gloves and to cover any cuts/abrasions they may have. Vaccination is possible through Coopers® Ovilis Campyvax. This vaccine requires naïve ewes to be vaccinated at least 2 weeks prior to joining and a second vaccination once the rams come out from the ewes. Thereafter ewes should receive an annual booster at least 2 weeks prior to joining. Ewe lambs, maiden ewes and newly purchased ewes in flocks that have been identified. Vaccination costs roughly $1.10 per shot per animal. Serology on ewes can be conducted in following years post vaccination to check on herd immunity. Camplyobacter is a zoonotic disease. As such, appropriate hygiene measures must be adhered to. This involves picking up aborted fetuses and their associated materials with gloves, and thorough washing of hands with soap and water prior to eating or drinking anything. Clothes, shoes and equipment should also be washed after handling any contaminated material. Pregnant women and immunocompromised individuals are advised not to handle aborted foetuses. Erika Bunker and Patrick Staples, veterinary pathologists at EMAI for providing their comments in regards to the pathological lesions described. Coopers® for providing the data presented in the discussion section.